Polygal is a fantastic tool to cover pergolas, awnings, patios, and any other outdoor space you can create. It is a durable product that lets light in but blocks UV rays, rain, and, most importantly here in Texas, HEAT! 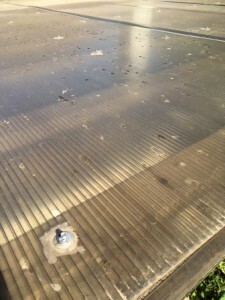 However, improper Polygal installation can damage the product and greatly reduce its lifespan. We have established a list of the top three issues directly resulting from installation mistakes that can be easily avoided. We recommend consulting with a professional before beginning installation. Polygal can offer years of use and enjoyment with the right installation techniques. Discoloration occurs when the product is installed upside down. Only one side of the Polygal has a UV protection layer. If this side is facing down, the unprotected side will yellow due to sun damage. It will also cause the sheets to become brittle and thus more susceptible to things such as hail damage. The Polygal sheets are delivered with a protective film on both sides with the UV side labeled accordingly. The best way to insure you don’t install the sheets incorrectly is to leave the UV side film on until after installation. 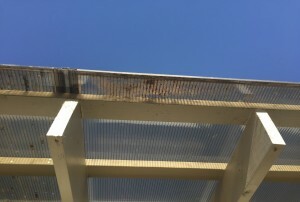 *TIP* The protective film should be removed as soon as installation is completed. Prolonged exposure to the elements will cause the film to be next to impossible to remove. Once moisture and debris finds its way into the flutes, your Polygal will never look as nice, and it will take some serious work vacuuming or blowing out each individual flute. Here are a couple ways to avoid this issue. 1. STORAGE! store your Polygal covered in a dry place with the UV protected side facing upward. Avoid walking on the Polygal at any point during the installation. 2. Check that you have all the necessary materials to correctly install the Polygal before starting installation. Once your Polygal sheets are screwed into place, you should apply the vent tape to seal off open flutes ASAP. Leakage is the #1 issue that customers contact us about. There are several mistakes that cause leakage to occur, but they are all easy to prevent. Your roof should have a minimum slope of 10% to keep water moving in the right direction. Do not have any seams running horizontally or perpendicular to the slope. For this reason, we offer 24 foot long sheets of Polygal. Make sure to pre-drill holes larger then the screws themselves and use a sealant. This allows for expansion and contraction from the weather. This entry was posted in This & That by Kelsey Claney. Bookmark the permalink.